About | Omega Cleaning & Sanitation, INC.
Omega Cleaning Company was founded in 1997 in Hamtramck, Michigan, a Polish enclave of Detroit by a Polish American businesswoman Krystiana Sunklad. It started as a small cleaning service employing few part time workers. However, as the reputation of the company as an outstanding cleaning services provider grew, so did the business, allowing OCC to become a significant player on the janitorial service stage in the Metro Detroit Area. Over the years, Omega Cleaning expanded its services from simple “cleaning” to a broad range of cleaning and janitorial solutions for small, medium and large businesses. Those services now include completely customizable cleaning solutions, day and night janitorial services, professional sanitation, carpet and upholstery cleaning, window cleaning, post construction cleaning, strip and wax, emergency assistance programs and floor care. The company successfully serviced such distinguished clients as FEMA (when the disaster struck the State of Michigan with a dreadful tornado, Omega was there to help clean up the community). We have also provided services for number of businesses across Metro Detroit. Omega Cleaning Company is a Proud Member of the Better Business Bureau. 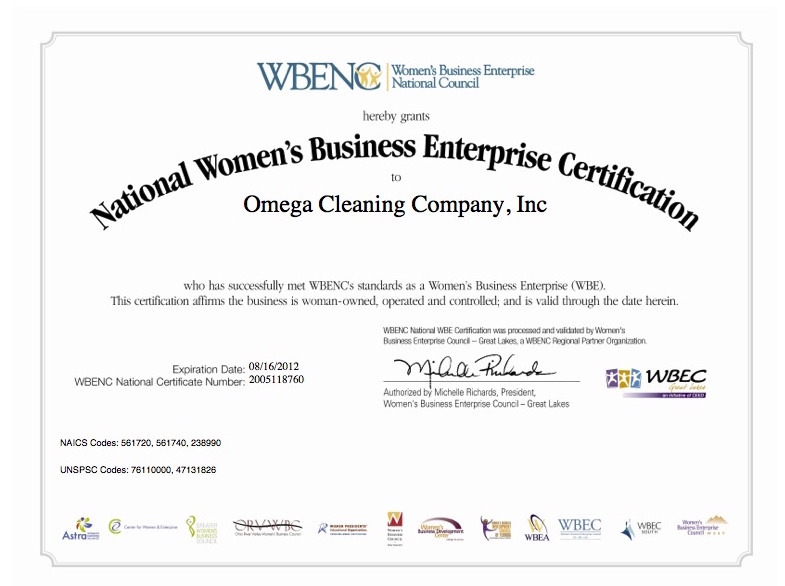 We are proud to announce that we are certified as a Women’s Business Enterprise with Women’s Business Enterprise National Council. The Women’s Business Enterprise Council-Great Lakes of the Center for Empowerment & Economic Development (CEED) has assumed a leadership role providing opportunities for nationally recognized certification of businesses that are minimally 51% owned, operated and controlled by a woman or women. As a women’s business center, CEED’s commitment for helping women has led us to establish, along with Michigan based corporations and government purchasing programs, a certifying council called the WBEC-GL Certification Program.